Cocoa growing in Uganda is growing at a fast rate due to the increased market in Uganda but most especially outside Uganda. The crop is estimated to be grown on 20,000 hectares of land since most farmers are not well aware of the market and its value in the country. This produces softer pods and these pods have 20- 30 beans inside which are either pale purple or white in color. The beans have a chocolate flavor and the pods are red. These are grown mostly in West Africa and they have beans which have various colors and have like thirty beans or more inside each hard pod. This has pale purple beans and a yellow pod. It produces the strongest beans and has a very hard pod and it’s the one type that is mostly grown in. You need to get seeds that are still in the pod or those that have been stored properly after harvesting but they should be having roots. If the seeds dry you through they will lose their credibility to be planted again, so in order to get good seeds place them in a wet towel and a temperature of 26 degrees until they start rooting. Use 4 inch pots to place the rooted seeds and cove the pots with a wrap that is plastic. Make sure the temperature is of about 80 degrees and fill the pots with a seed starter that is dump. The seed should be placed in the pot vertically and covered with soil and after 5 to 20 days, the wrap can be removed because at this time the cocoa has sprouted and it should be placed where it can easily access sunlight before being transplanted to the main plantation. When the trees are two feet tall, you can transplant them to the main garden with a soil PH of 6.5 in a fertile area which receives enough rainfall throughout the year. The cocoa tree flowers between four to five years and by then they will be over 5 feet tall. You can wait for the flower to be pollinate by bees or do it yourself by had pollinating them but this must be done in the mornings. The cocoa trees grow in areas that have soil which has high water retention therefore they should be planted in an area which gets a lot of rainfall of between 1500 and 2000 mm. 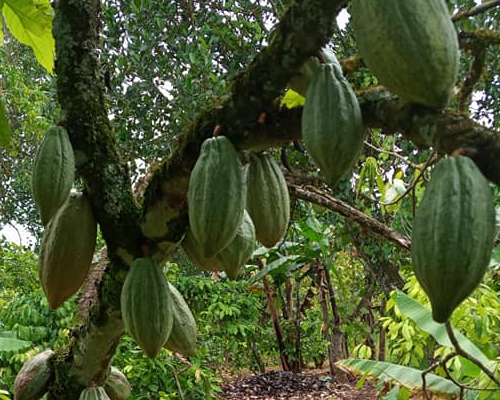 The ripening of the cocoa takes 5 to 6 months although it should be noted that the ripening depends on various factors that is the climate, the location of where it is cultivated and the type of cocoa grown. One of the things to notice when the cocoa pod is ripe is that when you tap it, it makes a hollow sound and the ripe pods have seeds inside that keep on rattling when they are shaken. The color of the pods changes for example if the pod is red, the color turns to orange and if the pod is green, the color changes to yellow when it is ripe. The harvesting is done by cutting the fruit using a panga form the trunk and make sure you do not damage the fruit buds. This is mostly done 10 days or a week after the harvesting process. You can use a wooden club to crack open the pod and separate the beans since this will cause minimal damage although it should be noted that a machine has been invented to separate the beans from the pods. The mostly common way people use to separate the beans from the pods in Uganda is by use of hands. A few people assemble with a large wooden box among them and start separating the pods by use of hands while placing the beans into the box. The discarded pods can be used for manure in the gardens instead of throwing them away. The sweating boxes, these are boxes that have holes in their slates and the holes allow fresh air into the cocoa preventing it from rotting. The heaping method is the mostly used in Uganda and this is where the farmer piles the wet cocoa on banana leaves on the ground. Spread the cocoa in a circle on the leaves and cover with more leaves for up to 5-6 days for fermentation to take place. After fermentation, the beans are dried traditionally under the sun spread on mats or sacks though one can also dry them using the drying equipment. During the drying process one can check for any damages made on the beans and after this, they are winnowed. The winnowing process is where the dried beans are sorted, cracked to separate the shell from the nib. This is where the beans are allowed to ferment and dry. The aging process keeps the beans in shape for future planting and processing. After undergoing the aging process, the beans are stored in a cool environment and dry before being transported to the market for sale and processing. This is caused by a virus and it leads to the swelling of the shoots and leaves. It leads to defoliation of the leaves causes stem swelling and the growth of nodes on the shoots of the leaves. It can prevented and managed by separating the cocoa plants with a 33 feet distance and the affected area should be cut off to prevent further spread of the disease to other parts. This affects the cocoa by the insect larvae entering into the pods before they mature. These make it extremely difficult to separate the beans from the pods and it can be prevented by placing the pods in plastic bags to prevent the insects from laying their lava on the immature pods. It is caused by fungi and its symptoms include branches that do not produce fruit, discolored leaves and pods which have uneven ripening and green patches. The infected area should be cut off and discarded whereas the cocoa should be planted in a clean environment as this will reduce on the spread of disease. This is caused by fungi and it causes the cocoa to have spots on the pods which are brown in color and it should be noted that they mostly affect growing pods. The application of copper and cutting down the affected area can prevent the spread of the diseases and if possible, the cocoa should be planted in the dry season. The climatic change in Uganda is a bit of challenge to the farmers in the country. This can cause immature growth of the cocoa pods leading to losses on the farm. There is also a problem of pests and diseases that attack the cocoa causing poor yields during harvesting period. Most of the farmers are not aware of the market for cocoa and they end up selling the cocoa for less than what it is supposed to be sold for making loses in the process. Cocoa has an increase in demand and this has become a problem because the cocoa produced does not meet the required demand. It provides employment opportunities to the people through labor and the farmer also earns big from the cocoa. Cocoa helps health wise in controlling heart attacks in people. Cocoa husks can b used as manure for gardens which improves the fertility of the soils. Cocoa is also a form of food in form of chocolates which are eaten by everyone after processing it. With the ever changing world and market all around, we all need to move with the changing world and cocoa is becoming a fast trending crop in the country. Therefore for those that want to earn a bit more and gain from the crop both through imports and exports, try growing cocoa and you will not regret it.